I was so confident that this week’s Baking Bible selection was going to be amazing that I made 2. 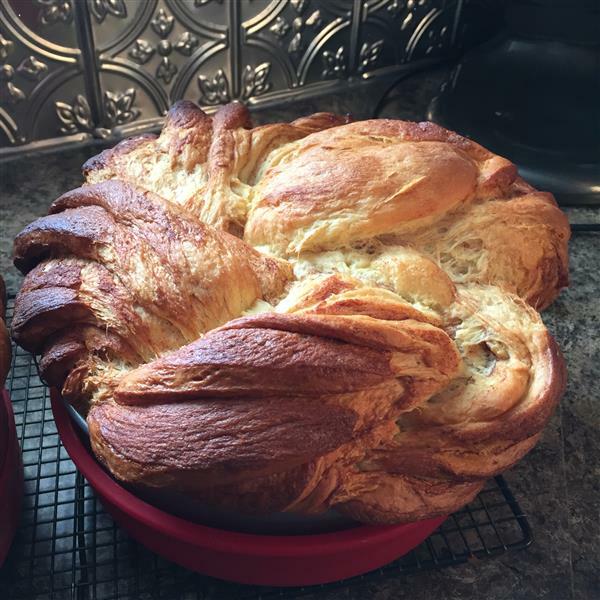 That meant a quadruple batch of brioche dough, which consists of a dozen eggs and a full pound of butter, not to mention the flour, sugar, and yeast. I started this on Saturday morning and wanted to take it to a party that night, so I took several shortcuts. I used the proof cycle on my oven for both the sponge stage and the rising stage, which made the yeast a little more active than it might normally be. I opened the fridge door at one point, and the dough had pushed the lid off its rising container and was doing a pretty good imitation of The Blob, trying to consume the neighbouring container of spinach. Fortunately, I caught it before too much veggie carnage could take place. 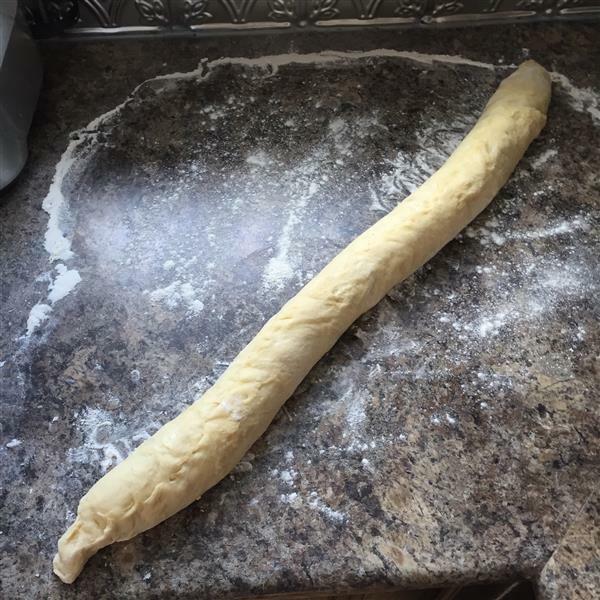 As I implied above, this recipe starts with a sponge, as the first step to making brioche dough. 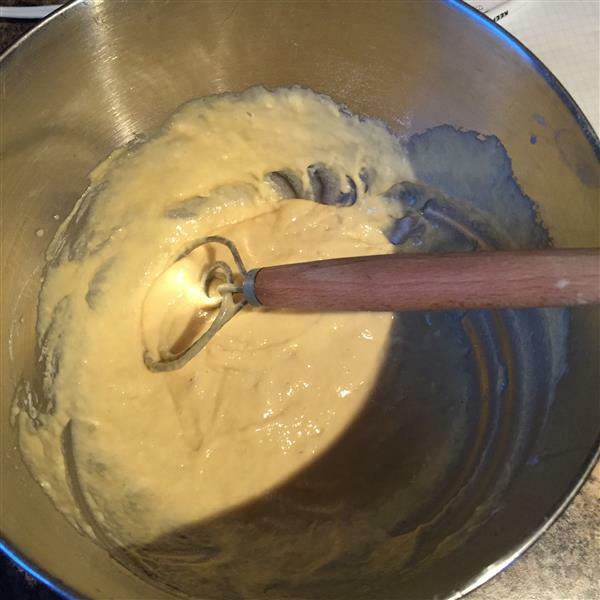 In this case, the sponge consists of some flour, yeast, sugar, water, and eggs. 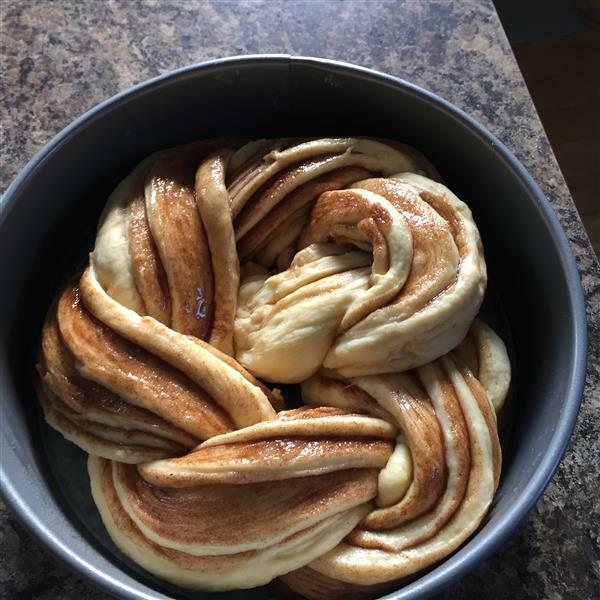 I find that the danish dough whisk does a really good job with a sponge, because it doesn’t get all clumped up and full of flour, and it’s really easy to pull through a batter this thick. Mom gave me 2 of these dough whisks several years back, and I use this smaller one all the time. After you’ve made up the sponge, you top it with the dry ingredients, then let that ferment for an hour and a half or more. I pushed it, and did 1 hr, in the oven, at 100 degrees. Next add the remaining eggs, and mix that up, then gradually add the softened butter. Knead until smooth and shiny and all balled around the dough hook, then into a rising container for a first rise. Again, I did this in the oven at 100 degrees. When it threatened to push the lid off the container, I stirred it down, and moved it to the fridge. Again, it pushed the lid off. At that point, I split it in two, did the whole “flatten into a rectangle and give it 2 business letter folds” thing, and back into the fridge in large Ziploc bags. In the meantime, I made hazlenut praline cookies, so I could get ahead for next week’s baking, since I’m going away for work next weekend. Once the dough’s threatening to pop the seams on the Ziploc bags, it’s time to shape it. For this, you roll it out into a giant circle… but I’m apparently not good at circles, so mine was a rounded square. Brush with egg, sprinkle with cinnamon and sugar. 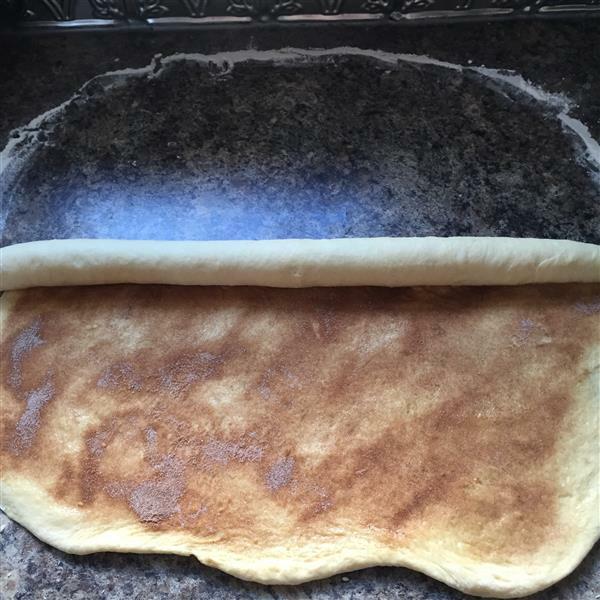 Roll it up like you would cinnamon rolls. Once it’s sliced, you overlap one over the other, in an X, then start twisting one over the other, keeping the cut side up. Wrap it around itself into a ring, and put it on a (greased) springform pan bottom. Snap the collar around the pan, and add a silicone cake pan for insulation. Move on to the second one, because you’re a sucker for punishment. 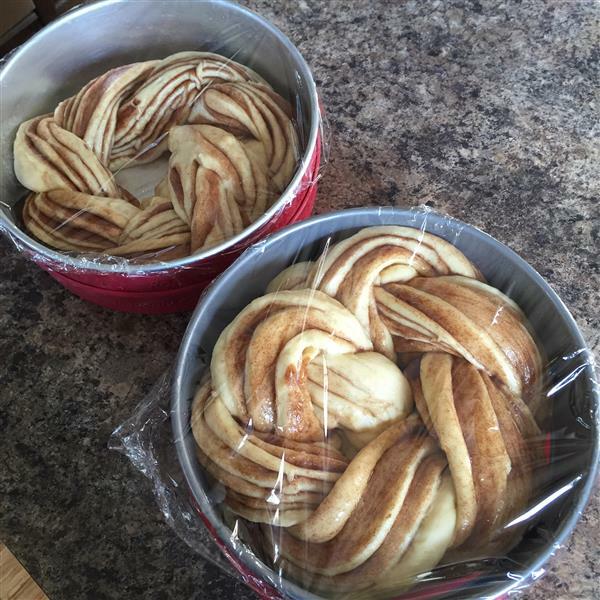 I didn’t have a second springform pan, so I took my chances and made the second one in a well-greased 9″ cake pan. It seemed to work out ok. They go into the oven for 20 minutes, before getting aluminum foil tents. I knew these were going to be monstrosities when they’d already jumped the pan after the first 20 minutes of baking. 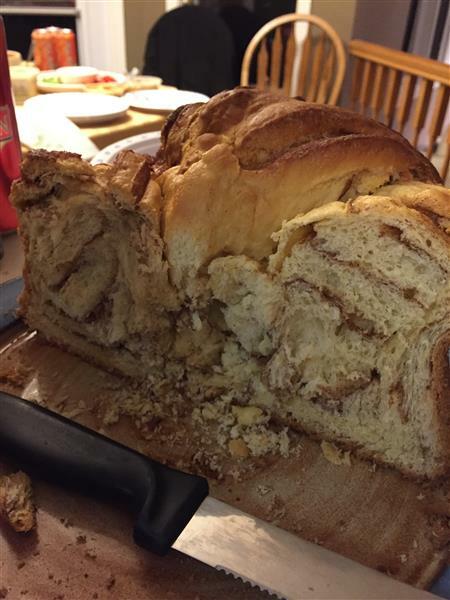 Posted on November 9, 2015 by KristinaPosted in The Baking BibleTagged brioche, cinnamon. 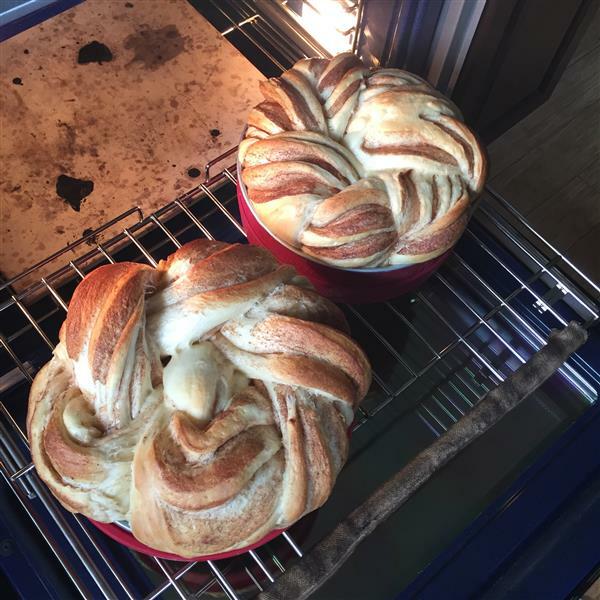 You are incredibly brave tackling a double “double” recipe! They turned out so nice. Your husband is funny! LOL! Your husband is so cute! I too think I should double-double it if i make it..